Il Trovatore, Opera in Four Parts (1853). 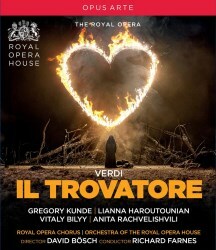 It was a good few years since Covent Garden last ventured to stage Il Trovatore. This production, first seen in July 2016, with Noseda in charge on the rostrum, seems to have had more than its share of revivals. There were critical reservations and I outline my own below. I do not deny the great tenor Caruso’s claim that Verdi’s Il Trovatore demanded the four greatest singer in the world at any one time to give full measure and satisfaction to the work. In reality there are not that many truly great singers around today to guarantee the quality of these Covent Garden revivals. Caruso's claim does not allow for the quality of the fifth major role, that of Ferrando and, at least as important, that of the conductor, all being essential to the realisation of a satisfying performance. This is particularly the case when the production and staging are, as here, of highly variable, even questionable, quality. With Kasper Holten, still Director of Opera at Covent Garden at the time of the premiere, seeming intent on importing regietheater and hang the outcome in relation to details of historical time or veracity of the storyline, it is worth recalling Verdi’s meticulous care in respect of its libretto and music. That care meant that the premiere at the Apollo Rome on January 19th 1853 was a mere six week before the third of his great middle period works, La Traviata, at Venice on March 6th. The fraught timescale was a consequence of the health problems and untimely death of the intended librettist, Cammarano. The work was thus completed by the young poet Emanuele Badare and the composer had to work on two very different operas at the same time. For those interested I give a more detailed account of the work’s gestation as an appendix to this review. The updating in this production is evident from the start by the arrival of Ferrando accompanied by a Second World War tank and by his troops in appropriate uniform. The track guards of the tank also serve as a repository of the cans of beer that the troops consume. The upside of this scene, as in so much of the performance, is that of the soloist concerned. In this instance Alexander Tsymbalyuk, in the role of Ferrando, has both tonal nuance and richness plus excellent characterisation. His qualities inclined me to regret the character’s sparse presence in rest of the opera’s proceedings (CHs.1-2). As the bats circled on the skyline, a cinematic effect, I was also impressed by the presence and quality of the Covent Garden male chorus (CH.4). A quality which they maintained throughout the performance. In Scene 2, with the stage very dark, it is easy to see why Leonora confuses the Count with Manrico. In the role of Leonora, Lianna Haroutounian sings with consistent beauty of tone and excellent legato, though her coloratura divisions need sharpening. However, her acted interpretation lacks belief, mainly as she rarely knows what to do with her arms. This is but one weakness of her acting. In a recital, or on a CD, her Act 1 Taccea la note placida (CH.6) would be particularly appealing. In Act 2, the gypsy encampment gets of course the cliché of a modern caravan, this one somewhat dilapidated and decorated by multiple pictures of babies. Needless to say Azucena carries a doll about for most of her scenes, which ensures that the audience will have her obsession constantly in their minds. I have seen and heard various interpreters of the role since a memorable night at Covent Garden on June 6th 1973 when, in Visconti's respectful production of Verdi’s opera, the audience, including me, were blown away by the sung and acted interpretation of the role by Fiorenza Cossotto. She brought the audience to its feet at the conclusion of the performance with many later besieging the stage door. I recount that simply to note that, in the years since, I have not seen that interpretation matched until Anita Rachvelishvili, in this performance, who comes near in vocal quality and involved acted involvement. She exhibits, in her performance, all the attributes to scale the heights of the Verdi mezzo repertoire via committed acting, beauty of singing and outstanding vocal characterisation. Her Stride la vampa (CH.14) and later contributions, both sung and acted, mark her out as a considerable artist and one who would have impressed even Caruso! As Azucena’s supposed son, Manrico, this production brought Gregory Kunde’s Covent Garden debut! Why highlight the latter fact? Well, he has been around as a renowned bel canto tenor for many years, singing a repertoire that Covent Garden rarely dips its toe into. When it does so the tenor role tends to go to the high tenor of the day, Juan Diego Florez. Kunde sings all the notes, including those notorious ones at the conclusion of Act 3 Scene 2 (CH.33). He certainly does better than the Italian tenor on the night noted above. Kunde's acting, vocal and dramatic, was convincing, his only drawback was looking a little bit too old for this, or perhaps any, Leonora. As his birth brother, the Count Di Luna who sends Manrico to the gallows, the baritone Vitaliy Bilyy (replacing the terminally ill and now deceased Dimitri Hvorostovsky) faced a near impossible task. None the less, he sang with good, even tone and range of vocal expression whether playing would-be suitor or when faced with Leonora’s deceit when offering herself in exchange for Manrico’s life and freedom. If Anita Rachvelishvili stood out for excellence among a good cast of singers, the man on the rostrum, Richard Farnes, also deserves high praise. As a regular at Opera North’s performances during his period as Musical Director, I came to appreciate the musical qualities he brought to the work of the company and to its various stagings. Since his move away from Opera North, given what I and others saw of his undoubted strengths as a conductor, his lack of appearances on the national and international stage with major orchestras has been somewhat mystifying. I hope my criticisms of this staging do not inhibit others from seeing and hearing what Richard Farnes is able to draw from the Covent Garden orchestra and chorus. It is truly noteworthy and first rate. I suggest he deserves more opportunities with the cream of international orchestras than he has had since he left Opera North. A final word on the staging. If it seemed over the top modern in Act 1, it got no better, the entrance of Leonora into a nunnery could have been anywhere and the prison portrayed in Act 4 contained no cell, merely rolls of razor wire. I also disliked the gratuitous physical violence and killing. As with much of the proceedings, it was cheap and nasty! Stage Director, David Bösch. Set Designer, Patrick Bannwart. Costume Designer, Meentje Nielsen. Lighting Designer, Olaf Winter. Appendix. Verdi and the composition of Il Trovatore. Verdi had considerable troubles in respect of both the composition and staging of Il Trovatore. It was the second of his great middle period trio of Rigoletto, Il Trovatore and La Traviata, all premiered over a two year period from March 1851. Il Trovatore was originally intended for librettist Cammarano’s hometown theatre, the San Carlo in Naples. However, the theatre found Verdi’s fee too steep for their cash strapped situation. The composer then proposed the opera be premiered in Rome on condition the censors there accepted Cammarano’s libretto. At that point Verdi learned, through a friend, of Cammarano’s death. The Young poet Emmanuele Bardare, who had converted Rigoletto into Clara di Perth for Naples, undertook the completion of the libretto. Verdi paid Cammarano’s widow the full fee, plus a premium, as she was poorly provided for. These delays explain why parts of Il Trovatore and La Traviata were contemporaneously composed reaching the stage within six weeks of each other. The various additions to the libretto of Il Trovatore required of Bardare show Verdi was intent on a two-diva opera, with the voices concerned being of distinctly different ranges and colour. Needless to say the Rome censor quibbled about details. Their view was that a burning at the stake might be too vivid a reminder of the Inquisition. Also the words of the ‘Miserere’ had to be altered, as strict liturgical phrases were not allowed. With these relatively minor problems sorted, Il Trovatore was premiered at the Teatro Apollo, Rome, on January 19th 1853. It was a resounding triumph with the final scene being encored in its entirety. There were odd cavils about the gloomy subject and the number of deaths. The opera spread rapidly and was even parodied with baby swapping figures in two of Gilbert and Sullivan’s most popular works. Six weeks later, in an entirely different orchestral dress, and vastly different requirements for the tenor and soprano, La Traviata was premiered in Venice.